Slightly over a year ago I wrote about my experience spending 2 months in a village in Japan exclusively to learn more about tenkara. It was published in the Fly Fish Journal. While I wrote about most of my experiences in this blog, I also wanted to write something that could have longevity and encompass my experience as a whole. Today I booked my plane ticket to go back to Japan this August. As I thought about what adventures I’d be seeking I decided to revisit the article I wrote. And, I realized I never had a chance to share it with you. If you’re looking for some reading this weekend I hope you’ll consider reading my story. I’d love to hear your thoughts about it too. 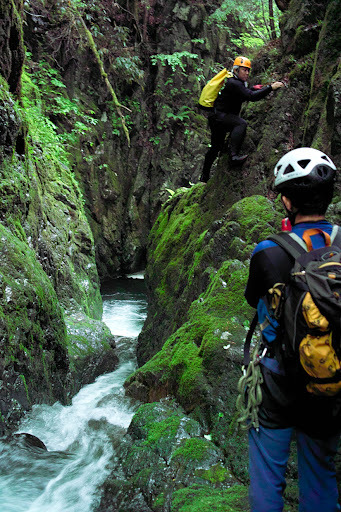 I was clinging to mossy rock with half my body under a waterfall. Fifty feet below, the torrent crashed into a small basin sending mist into the air, keeping my companions soaked. Mr. Futamura, watched apprehensively. Next to him, Kumazaki, about 20 years younger than Futamura-san and slightly older than me, preferred to stare at the pool in front of him for any signs of iwana, the wild char found in the mountains of Japan. A fishing rod, small box of flies, spool of line and a spool of tippet were stowed away in my backpack. No reel required. As it tends to happen with fishing, we lost track of time somewhere along the way and now faced the crux of the trip. It was 7 p.m. and inside this lush forest it would turn dark soon. After a full day of rappelling, swimming through pools that cut through impassable canyons, climbing rocks and waterfalls, and of course fishing, we were all tired. The route ahead looked straightforward and within my comfort zone, the only caveat being it was a wet climb — very wet. My task was to climb to the top, set up an anchor and belay my partners up. Simple enough. But, simplicity and ease sometimes have little in common. Twenty feet from the top, features on the rock face disappeared on the drier left side and forced me closer to the waterfall, where thick moss oozed like a wet sponge. I was long past the point of no return. I pushed past the fear and focused; hands and feet, hands and feet, hands and feet. The banter between Futamura and Kumazaki suddenly stopped. All sounds, including the roaring of the waterfall, seemed to vanish. My trip to Japan was a journey of discovery. 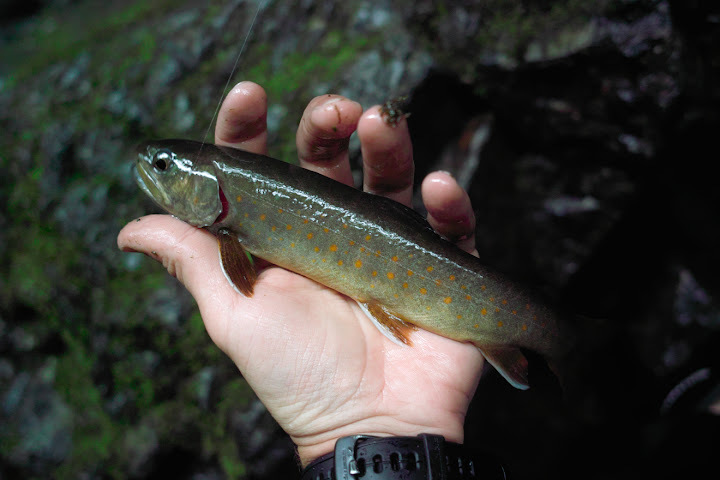 For two months I stayed in a small mountain village, learning everything I could about the one thing I told my friends I was going in search of: tenkara. In reality, I already knew a lot about tenkara. Three years ago, on my first trip to Japan, I introduced myself to this traditional Japanese method of flyfishing that uses only a long rod, line and fly — no reel. After returning from my first trip to Japan, all I could think of was tenkara. It offered a new way for me to challenge those mountain streams I love. I imagined how great it would be for backpacking and that it would be a simple, fun way to introduce people into flyfishing. There were just so many possibilities. With little information and no gear available stateside, I took on the task of introducing tenkara to the US. Over several long months, I created Tenkara USA and since 2009 have been introducing tenkara to anglers outside of Japan. However, despite the knowlege I gained in the last three years, particularly under the tutelage of Dr. Hisao Ishigaki, the leading authority on tenkara in Japan, I knew there was much more. Tenkara is a deceivingly simple form of flyfishing that holds deep historical, cultural and technical layers. Just as the practice of metalworking appeared independently in the Fertile Crescent of the Middle East and among the Incas in South America, evidence suggests that flyfishing emerged in Europe and Japan independently of one other. Tenkara is similar to the original mechanics of flyfishing practiced by the likes of Dame Juliana Berners and Charles Cotton, the best-known historical practitioners of fly-fishing in the West. However, anglers have practiced similar fixed-line methods in many other parts of the world like Spain, France, Italy and Poland. Yet, unlike the original Western flyfishing methods, tenkara still lives in Japan. One main distinction separating tenkara from Western flyfishing is its origin — tenkara was an art of necessity for peasants, not a sport for the idle classes. While the West went to work designing fly patterns, weights, strike indicators and other gadgets to control the reach of a fly or make the activity “easier,” the typical tenkara fishermen of today adhere to the original practitioners’ thrift and reliance on skill. At the risk of seeming irrational to a Western fly angler, most tenkara anglers rely on only one fly pattern, no matter where they fish or what is hatching. As the tenkara philosophy goes, attaining a mastery of skills and technique are more important and efficient than second-guessing fly choice. Tenkara felt like my own personal Machu Picchu. Here was a rich but hidden mountain culture relatively unknown to the West, so unpublicized that the coastal Japanese themselves only became more aware of it in the second half of the 20th century. While researchers can find numerous Western flyfishing references going back as far as 200 AD or beyond, in Japan, records of the sport only travel back a few generations before disappearing into the forest along with the original, albeit illiterate, practitioners of tenkara. Even the origin of the name, tenkara, is unknown. The phonetic reading of “ten kara” could give it the meaning of “from heaven”. However, the name is written in katakana characters (テンカラ), a Japanese syllabary mostly used for words of foreign or unknown origin. This leaves few clues, but opens several theories on the original meaning of the word. The most common stems from the way a fly lands, from a fish’s perspective, as if it were coming “from heaven.” Until recently, in most parts of Japan, the method was referred to as kebari tsuri. Kebari means “haired hook” (artificial fly), and tsuri means “fishing.” In the late 1970s, as the Japanese rediscovered traditions that flirted with extinction during periods of dramatic economic dislocation, a handful of tenkara enthusiasts began using the term tenkara exclusively to clearly differentiate the practice from other types of fly fishing. Nowadays, in the appropriate context, it’s used to describe flyfishing sans reel. I wasted no time getting to the mountains of Gifu prefecture, the region of Japan where tenkara possibly originated. Two friends from Tokyo met me at the airport, we loaded into a rented Nissan, and immediately headed for the mountains. The suburbs of Tokyo sprawled endlessly on both ends of the city; a sea of lights with tiny rice paddies in lieu of backyards. Mountains on the horizon appeared impenetrable, abruptly bordering the suburbs, as though the country was too small for foothills. The seven-hour drive Southwest was a bridge between two worlds, betraying how a mountain culture could have remained unexplored within a country the size of California. Traveling at 60 miles per hour I imagined how, just 100 years ago, it would take a full day to cover what I did in 10 minutes. I could easily envision how a mountain fishing technique could survive here, unknown to the population centers on the coast and the world beyond, for so many years. We arrived in Maze, a small mountain village of approximately 1,400 souls in the prefecture of Gifu. Kazuhiro Osaki, who goes by the name Rocky, and his wife Ikumi, would host me during my stay. For several years, Rocky and his wife have managed the Mazegawa Fishing Center, a tourist center established on the banks of the Maze River to promote angling tourism and other activities in the area. Their home was quaint; my lodging a traditional tatami room with its typical grassy fragrance. A seat at the kitchen table provided a clear view of the mountains to the south. Being the monsoon season, sparse clouds frequently enveloped the mountains. I couldn’t have asked for a more scenic location or for better hosts – it felt like a dream. Most mornings evolved into a pleasant routine of writing and taking care of the business side of Tenkara USA while drinking a cup of coffee and enjoying the mountain views . In the afternoons I visited the fishing center and tried to uncover the different layers of tenkara through fascinating interviews and encounters with individuals who made (and continue to make) its history. In the evenings, I’d try to fish the yumazume, loosely translated as the “evening activity period” until it got too dark to see. Perhaps the mountain culture of tenkara has always been too rich to ever really be in risk of true extinction. Talking to some early Japanese explorers of the tradition, I wonder how close Japan came to losing tenkara. Eighty-nine year old Mr. Ishimaru Shotaro heard about my curiosities through the region’s social network. He came to the fishing center to meet this gaijin (foreigner) who was so interested in his tenkara. He guessed it was 1934 when he began watching a tenkara angler near his hometown of Hagiwara. He explained that approaching a stranger to ask about his techniques simply wasn’t done at the time. Keeping a subtle distance, Shotaro-san followed the angler for an entire summer, periodically going off on his own to try out the techniques he observed. This is how he learned tenkara, then taught others in the area, and is now often referred to as a tenkara meiji, or “tenkara master”. 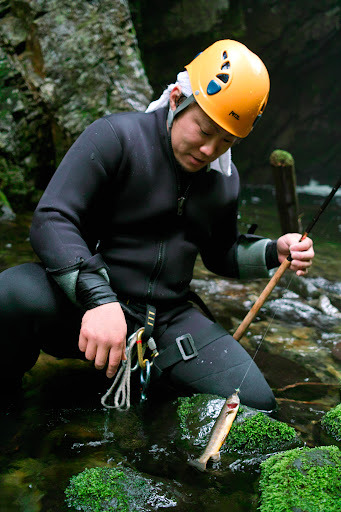 Without any records to prove otherwise, Shotaro-san may have been the first tenkara teacher in the country. I asked him why today’s young people think that fishing is difficult, even thought he taught himself the practice simply through observation – and despite the availability of books, magazines and videos. He responded simply, “There were a lot more fish back then.”Mr. Shotaro described how at that time, when the damming of the rivers that accompanied Japan’s industrialization was far from complete, he often caught 100 fish a day, with a personal record of 150, numbers common and somehow sustainable among the professional tenkara anglers of the time. When I met him, Shotaro-san couldn’t trust his body the way he did a decade earlier. His legs started giving out three years ago and since that time, he had not visited the water. Nonetheless, one hour of talking about tenkara was just too much for him to bear. As he had done a hundred times in our conversation, every time he remembered a story about fishing and his youth, he smiled. But this smile was a different. I could tell he wanted to fish again. In a very soft voice he turned to his nearby student and said, “tsuri o shimashoo!” –“let’s go fishing”. After helping him put on waders, his student and I assisted Mr. Shotaro into the waters of the Mazegawa. Mr. Shotaro said he wanted to fish with me, as he didn’t know if he’d ever have another chance. With a new vigor, his casting was fluid and precise, the manipulation of the fly enticing. In a stretch of river that yielded few fish in the two months I was there, Shotaro-san got a fish to rise on his third cast. In the early 1960s, the practice of tenkara was as mysterious as it was in the prewar period. 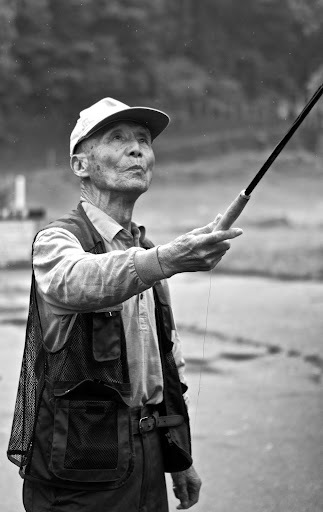 Katsutoshi Amano, a name known to all Japanese tenkara practitioners, had to learn the sport exactly the same way Shotaro-san did before him. As Amano-san said, “Asking a man about his technique just wasn’t done at the time; I had to ‘steal’ the technique from him.” Ironically, given their age difference, and the fact that both are from Hagiwara, there is a good chance the man Amano-san followed and mimicked was Shotaro-san himself. Dr. Hisao Ishigaki, my principal tenkara teacher, and Mr. Amano were instrumental in popularizing tenkara among the Japanese starting in the late 1970s when Japan, at the height of its economic boom, began to rediscover itself and its traditions. In 1985 Japan’s largest TV network produced a segment on the sport giving people throughout Japan an idea of what tenkara was about. Nowadays newcomers can look it up online, watch videos, and choose from a collection of books and magazines that offer lessons on knots, flies and techniques. A once secretive practice that provided employment to landless peasants is now a source of fascination to urbanized Japanese and to a growing number of participants in the US and other countries. Two months went by faster than the glimpse of a rising trout. But I was happy I found the time to fish a little on a daily basis. My worst fear was that I’d end the journey wasting a lot of time and not “finding tenkara.” I feared my relatively reclusive nature would send me deep into the mountain streams searching for the soul of tenkara anglers from centuries ago, rather than seeking people who are alive and carrying on the tradition. My fear of wasting time didn’t come true. I enjoyed incredible encounters with old masters, meetings with craftsmen, a very enjoyable time with my hosts and their friends and a lot of fishing too. But I also craved adventure. The same isolation early tenkara fisherman enjoyed was a little more difficult to achieve in modern Japan. 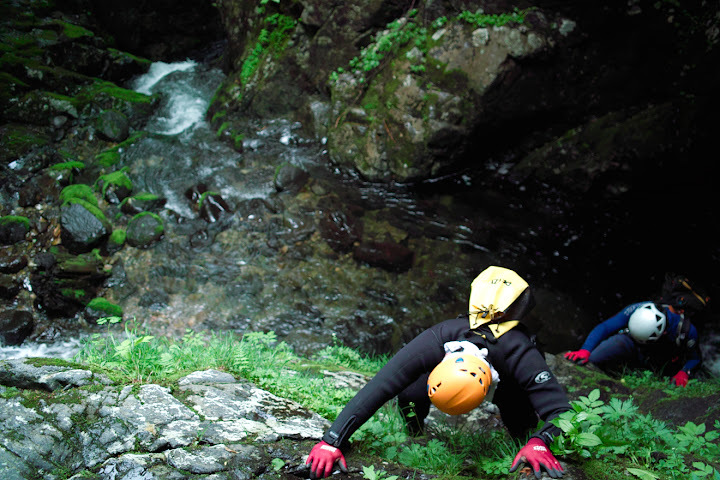 So we took to the challenge with canyoneering shoes, neoprene wetsuits, rope and harnesses, and our tenkara kit mixing fishing with what is known as “shower-climbing”, a mix of canyoneering with climbing waterfalls. It seemed tenkara and shower-climbing were made for each other. 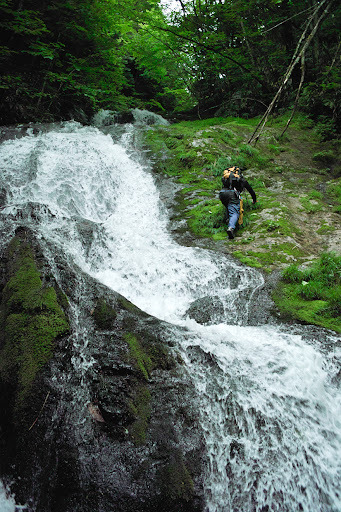 Our portable gear didn’t add weight to our packs and the telescopic rods could quickly be stowed away as we prepared to climb a waterfall. By conquering wild, pristine and remote waters, we would earn our right to practice tenkara there. We set off on an expedition that took us to rugged tenkara-perfect mountain streams, far from the masses that leave many streams ravaged and devoid of fish. Out here, I finally felt the spirit of tenkara fishermen from eras gone by; they disappeared into the forests for weeks at a time, camping and fishing the streams, drying caught fish and finally, when the catch threatened to be too heavy to carry out, headed back to the village markets. We planned to build a fire by the river, where we would eat a trout from it, “shioyaki-style”: only sea-salt coating the skin of the trout, a firm branch serving as a skewer. And, we would drink kotsuzake, a drink that, as I have come to appreciate, is underpinned with ceremonial and philosophical significance — though one shouldn’t picture a neat Japanese tea ceremony. Kotsuzake is primitive and raw. Preparing and drinking it is an act of homage to the principle of not wasting the resources nature provides. After separating them from the meat, we placed the bones of a few precious trout over the coals of the fire and lightly roasted them to bring out oils and flavor, then immersed it into the warm sake. The result is sake with subtle and tantalizing fish flavors — all part of the Japanese mountain culture, and now a personal practice, if I must eat a trout that I catch. Daniel, WOW! What an incredible article. I felt as if i was there with you! Could see the clouded mountains, feel the rain and mist, slipping in the wet rocks and moss covered ground. Tasting the salted fish and fish-bone saki. Great article, thank you! Tim, thank you! I really appreciate your comment. Really. Fascinating article! I felt like I was on the cliff staring up that waterfall. I’m sure that was a pretty intense experience. What an honor to have been able to fish with a tenkara master and modern tenkara pioneer, must have been a real special day. Thanks for bringing me along the trip. Jeremy, thanks for the comment. Was happy to have a story to share, thanks for reading it. That was an awesome story, it really painted a vivid picture for me. I hope you’ll be posting another story like this after your next trip to Japan. I’d also like to thank you for creating such an intuitive and thorough website. I’ve just started getting into Tenkara, and your website has been an invaluable source of information!